An ROV is a tethered underwater robot. This highly manoeuvrable vehicle can be operated by a person on a vessel at the surface linked by an umbilical cable carrying electrical power, video and data signals. The Falcon DR ROV System is a state-of-the-art remotely operated vehicle, equipped with HD video camera and various manipulator arms. There are two 14mm OD umbilical cables, a 330m (terminated onto a hand winch) and a 1,100 metres cable (not on a winch or terminated at present). 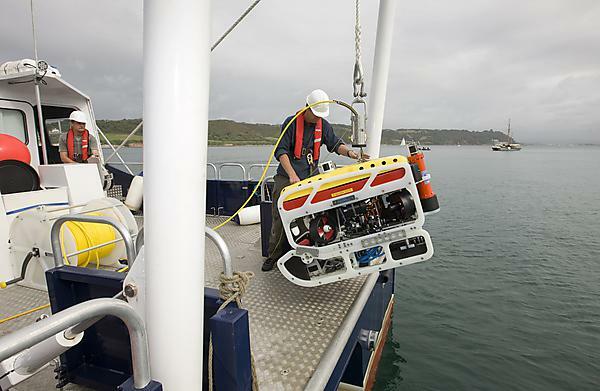 The whole system is rated to 1000m and is a highly customised research ROV used for oceanographic research, biological research and is also suitable for use in filming. Studying the sea floor on board the RV Falcon Spirit. The ROV has an umbilical cable which carries electrical power, video and data signals. Increasingly over the last few years HD video surveys are being used to replace the older digital video (DV) standard (640 x 480 pixels), which limits identification to specimens greater than 5cm in size in a 1m2 image. High Definition (HD) cameras (1920 x 1080 pixels) have almost 7 times the resolution of DV allowing us to see much more detail and even smaller organisms. The Marine Institute has recently worked in partnership with the Cornwall Wildlife Trust to map a seagrass bed, of which the ROV was a fundemental component. View footage and images taken by the ROV.